Let me put to you a question. Do you enjoy comic book visual effects, weaponised vinyl and sticking it to the man? Well then friend, welcome to Sunset City; your new home. For those of you who haven’t been paying attention, Sunset Overdrive takes place in Sunset City in the aftermath of an awesome apocalypse, or awesomepocalypse, if you will. Evil corporation Fizzco mutates the population of the city with their newest energy drink Overcharge Delirium XT. As one of the survivors you have to grind, bounce, climb, run and shoot your way to safety. Sunset Overdrive is something of an anomaly for this generation of consoles. It managed to avoid the hype of the bigger releases this year (Destiny, Assassin’s Creed), and yet it’s one of the most polished, most finished games of the year (not Destiny, Assassin’s Creed). However, just calling Sunset Overdrive finished does it a vast disservice, because it’s also bloody brilliant. Insomniac Games, in not trying to create a gaming event, has instead created a game. 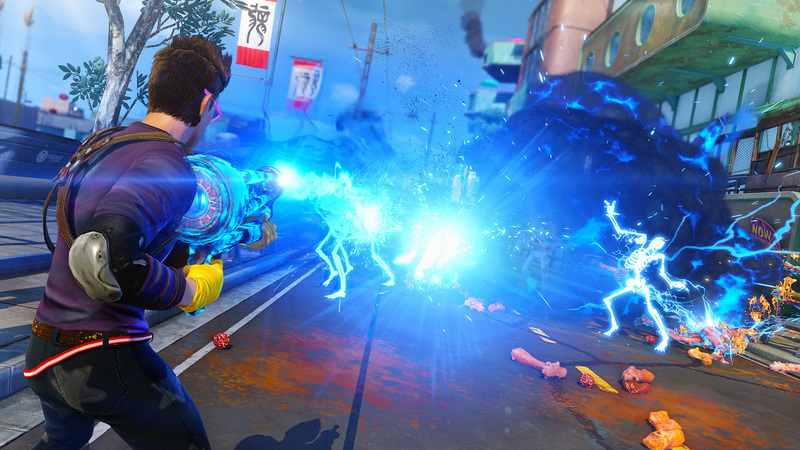 Sunset overdrive combines Saint’s Row and Skate or Die, with all of the best elements of Dead Rising. The result is a ballsy, funny, furious rollercoaster. The bubblegum aesthetic is beautiful, with the city feeling like a living comic book, the mutant abominations are equal parts disgusting and hilarious, and the cast of characters is frankly hilarious. Sunset Overdrive is the sum of a thousand loving little touches by Insomniac. Nothing is revolutionary per se, but nothing is gratuitous. The game is extremely measured from character creation and customisation to soundtrack to gameplay. Everything just feels so slick. While the express hype train might have bypassed the stop at Sunset City, it’s more than worth a visit. Sunset Overdrive is the perfect antidote to the cloud of disappointment that’s hung over a lot of recent releases. For anybody who wants to get back to good, honest gaming with more content and personality than you can shake a stick at.